IBPS PO Mains Result - IBPS has released online result for probationary officer examination 2017, check socore card, rank and cut off marks. The result for Mains Exam of IBPS PO 2017-18 has been declared by Institute of Banking Personnel. IBPS PO 2017 Mains Exam was heldon 26th Nov. 2017.Click on below link to check your result status, rank, score card and cut off marks. How to Download IBPS PO Mains Result 2017? IBPS PO 2017-18 Final result will be based on the cumulative score of PO Mains Exam 2017 and the IBPS Interview Process obtained by a candidate. 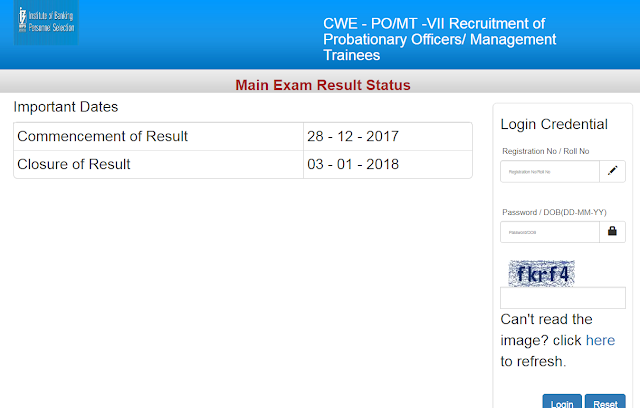 Candidates who will be selected after the final round of Probationary officers will be handed the appointment letter to join the Bank of their choice.